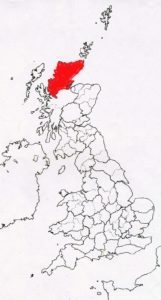 This extensive area, covers the old counties of Caithness, Sutherland and the mainland part of Ross and Cromarty. 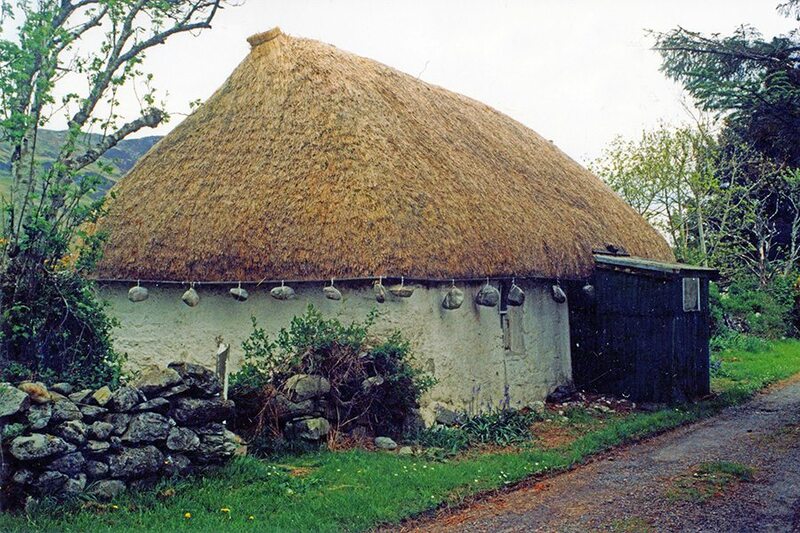 There is much variation here, in both thatching materials and methods. Mainly, but not exclusively, following the Highland thatching traditions. Straw was, for a long time, too valuable as a animal feed to use as thatch. So rushes, grasses, bracken, broom and heather were used; in it’s stead. 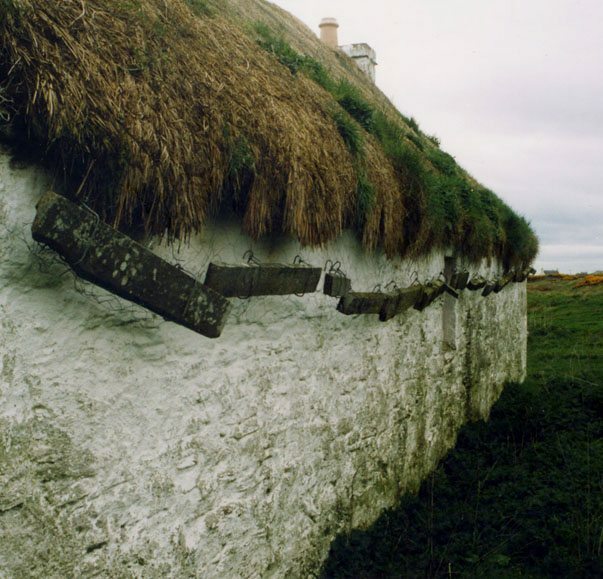 Most thatching uses the directional method; a layer of thatch; over a turf base. With weighted ropes; or from about 1930, wire netting, holding the thatch in place. Some use of spars and liggers is known. Here called scrobs and wands. But the heavier version, known as crooks and cabers is more common. A supply of suitable wood was needed, for these. This was always a problem, in the Highlands; putting a limit on the use of these fixings. 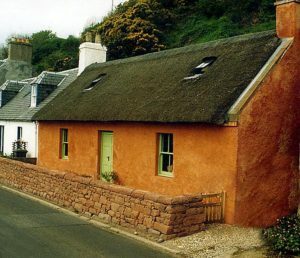 In the south east of this area; around the Black Isle and Easter Ross, Northern style methods, have completely replaced the Highland thatching tradition. Showing the hand of the improving landlords, of the eighteenth century. The agricultural reporter, in 1795, noted new work being tied on and the use of the stobbing method. 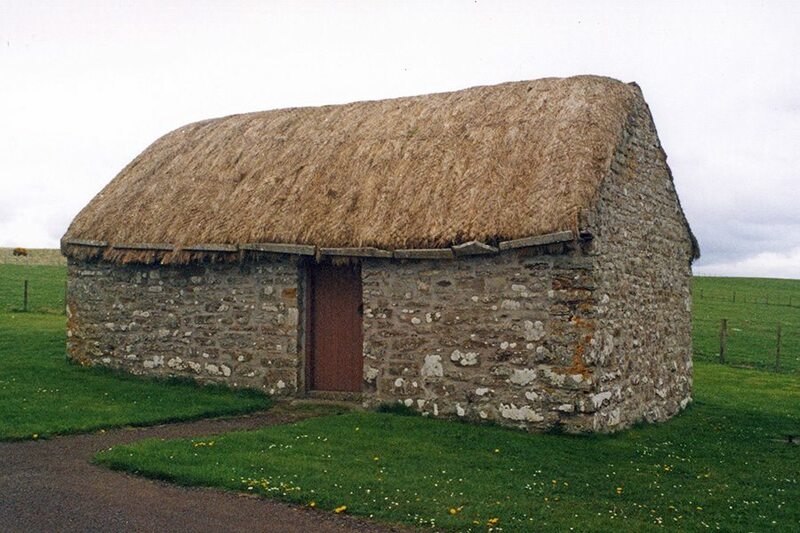 The practice, from across the Moray Firth, of covering the roof with clay was also carried out. These improved methods became fairly widespread but gales and lack of trees limited their use. A case of climate and material supply, taking precedence over fashion. 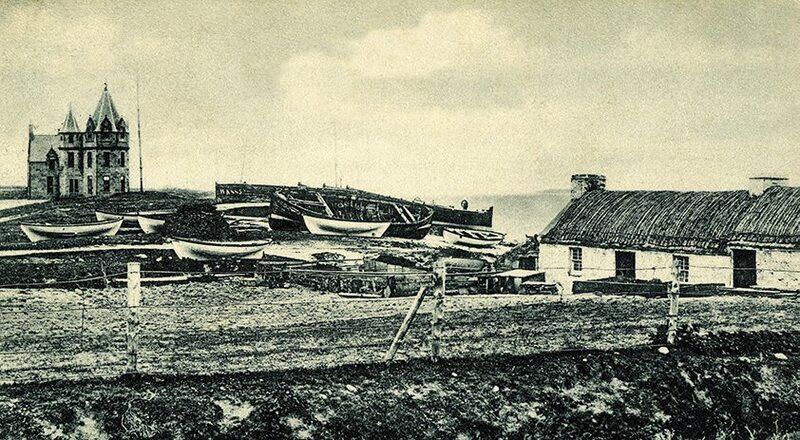 At John o’ Groats, in Caithness… In around 1900. 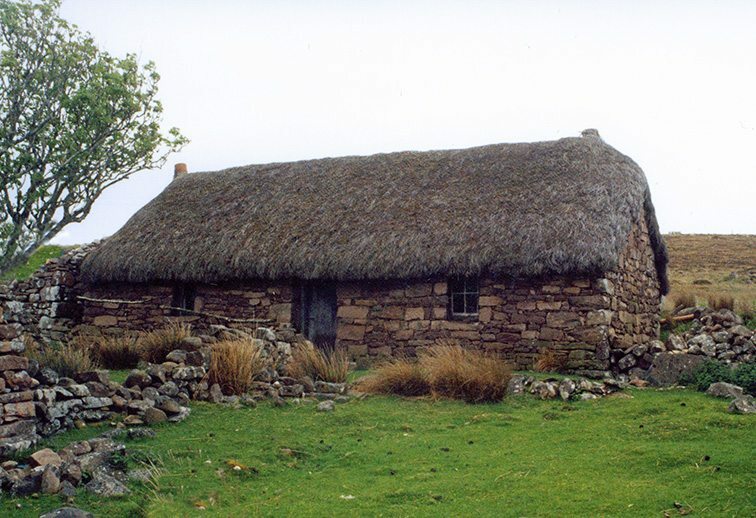 The roped and weighted thatch, being very similar, to that found in the Northern Isles. 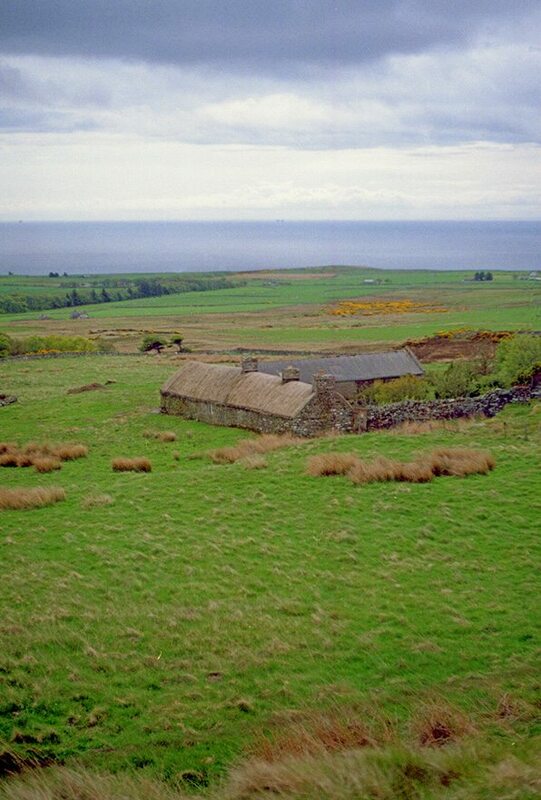 Below, near Latheron, in Caithness… Overlooking the North Sea is what became Scotland’s last working, thatched croft. Well roofed with directionally laid, local rushes. 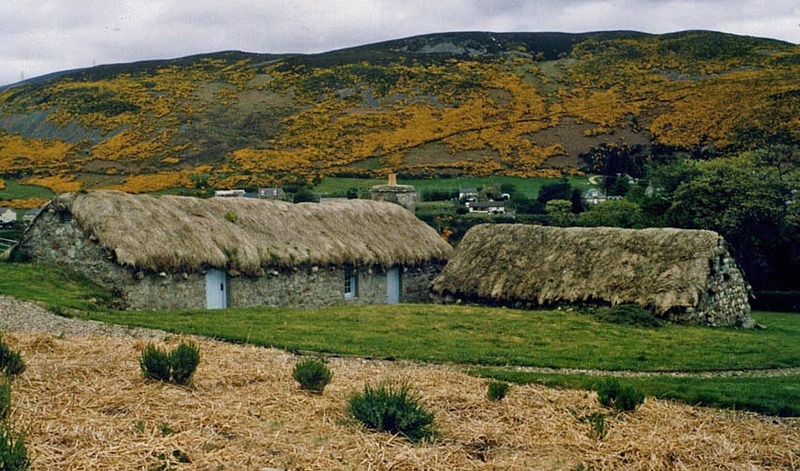 Coastal Sutherland… Restored thatch at Helmsdale. Consisting of local rushes on a turf base. 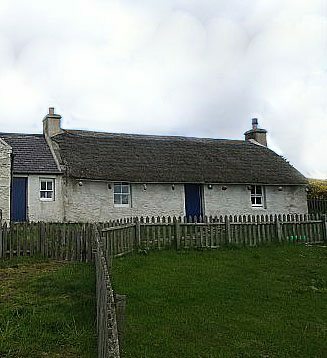 And a cottage, at nearby Gartymore, on the right. 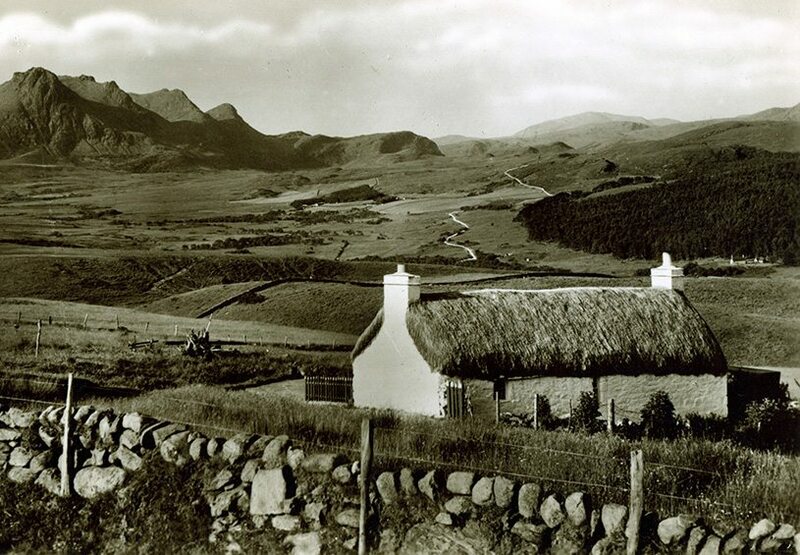 Inland, from Tongue in Sutherland… Around 1935. A wired and weighted roof. with a mortar ridge. 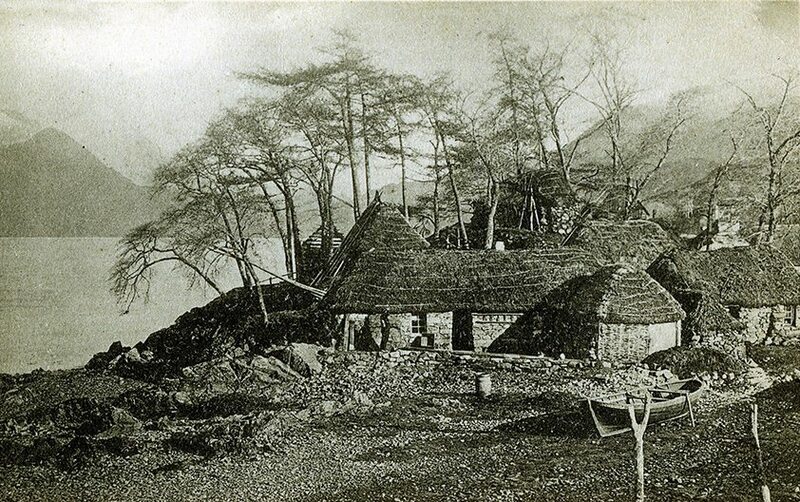 The Smithy at Kinlochewe… In around 1890. 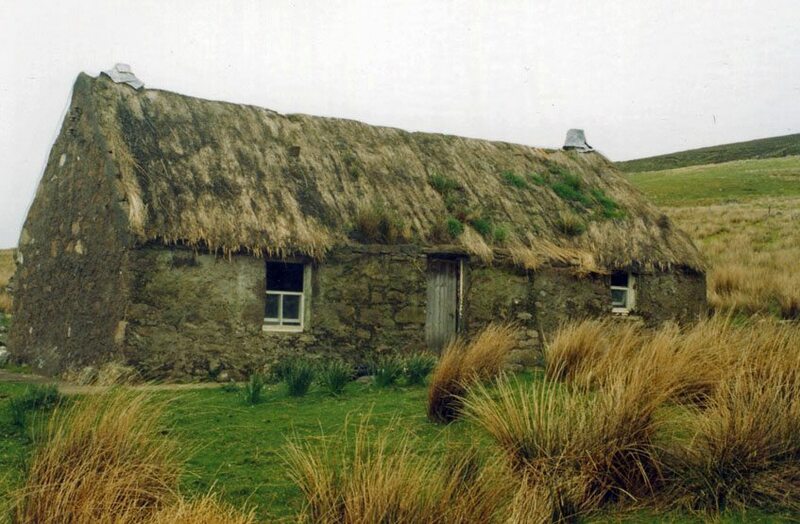 Less than twenty miles from the exposed coast and this roof has a standard thatch; probably of heather. With repairs using spars and liggers. An older image, from near Ullapool, shows similar work. If the locality provided a few trees, the local thatchers always seem to have made good use of them. It seems that thatched chimneys, or lums, were also still common. Wester Ross.. Worn rushes, at Melvaig, some repairs have been made to the eaves; but a rethatch is needed… As in much of this area, the rushes required grow freely around the property. Some heather thatch, on the right… At Plockton. The old underlayers have shown, that this 300 year old cottage, has never been covered with anything else. 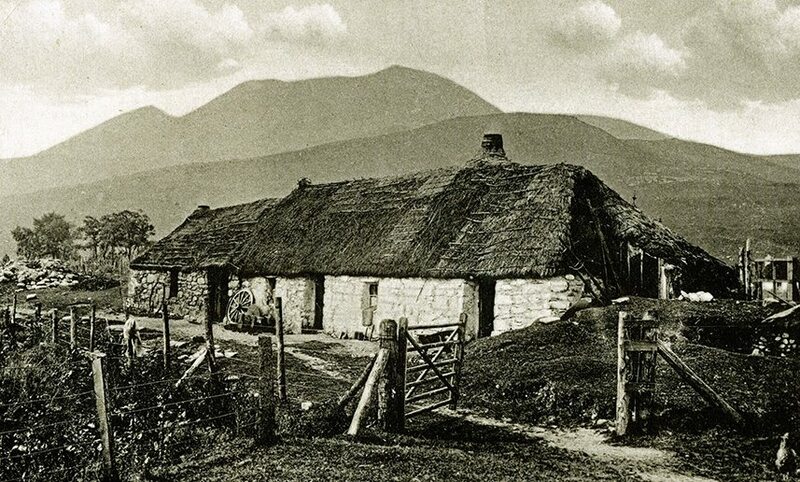 Roped and weighted… A cottage on Coigach, a peninsula north of Ullapool in Wester Ross . 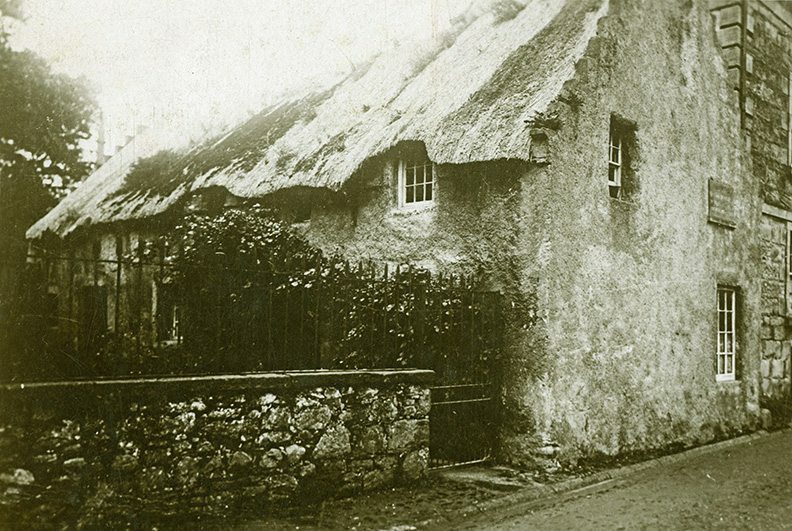 This 1900’s image shows a well thatched roof, roped and weighted. 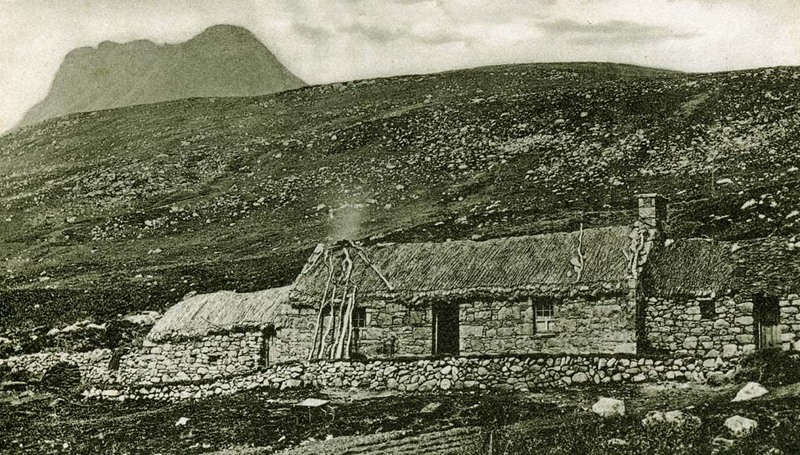 With the odd caber to add extra protection; a few lying on the roof, others leaning against one end… The mountain overlooking the cottage is Stac Pollaidh, with its distinctive profile. 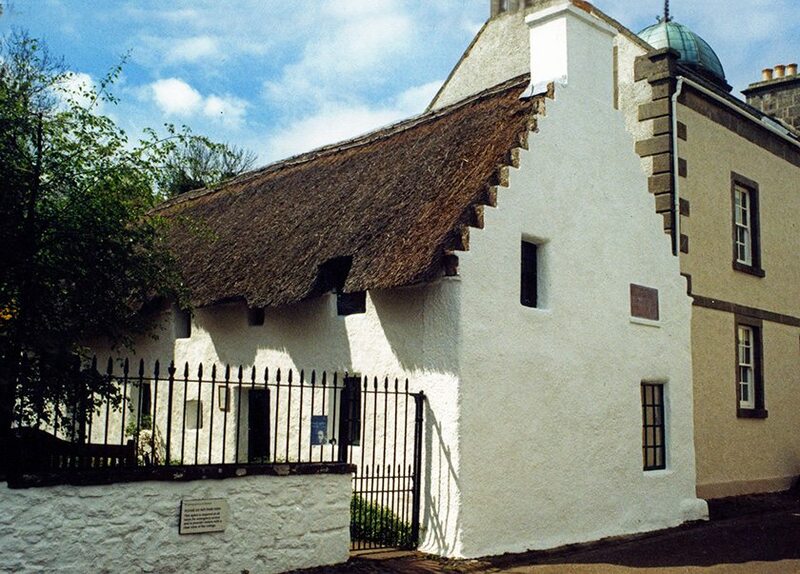 Restored thatch, on the left… At Lonbain, on the Applecross peninsula. A new coat of standard heather thatching. With a little weighting around the edges; as this is next to the sea. In one of the remotest corners of mainland Britain. Crook and cabers… From the 1880’s. Holding the thatch at Letterfearn, in Wester Ross. A close look will also see some leaning cabers, in use on the windward side. Overlooking Loch Duich. 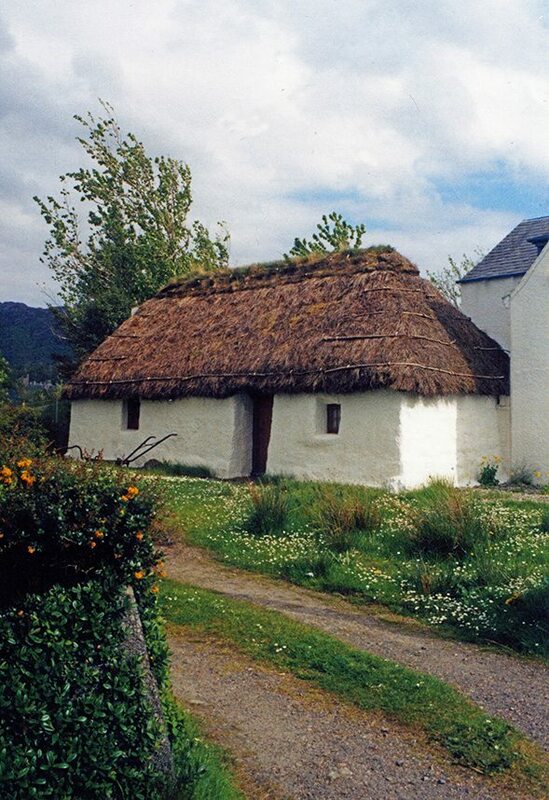 On the far side of Loch Duich…This well thatched modern roof, sports no wooden fixings. But relies on weighted wire netting. It is easy to assume, that before wire netting, a roof was always roped down. But this cheap and fast wire covering, may well have also replaced crook & caber fixings, like those at Letterfearn. Just a few miles away. An unassuming little barn, with some dark secrets… Photos; with kind permission of Laidhay Croft. 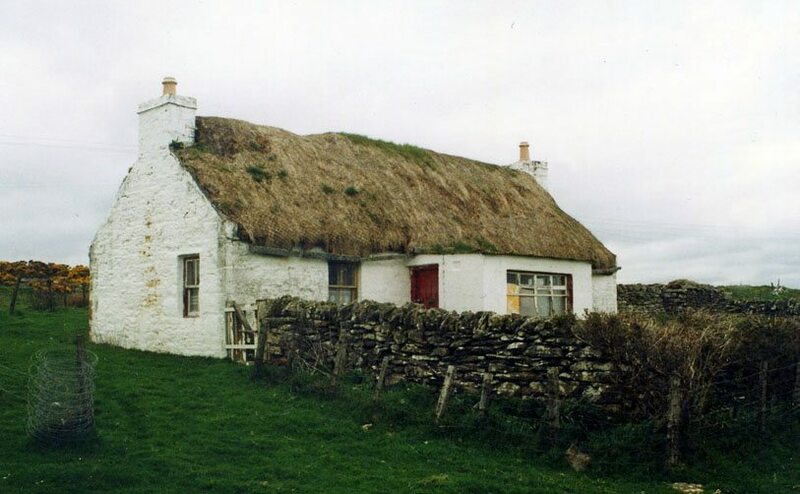 In his Agricultural report, for Caithness, Captain John Henderson gave a brief description of the craft hereabouts… He stated that many farmhouses were now slated, but ‘in some cases thatch roofed, with divots, or thin turf, 1000 of which are cut and prepared at the expense of 4s(shillings) which will thatch one rood and a half…. 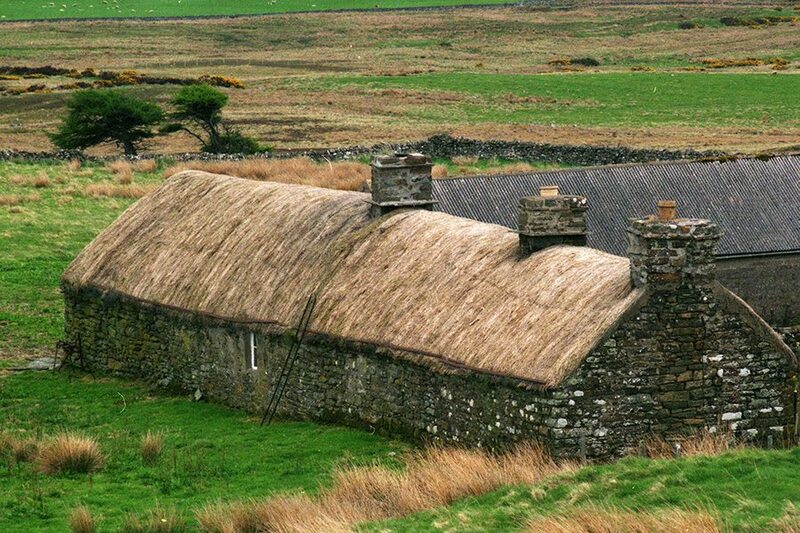 if a covering of straw is laid over the divots, the roof or thatch will last three or four years…. This lack of resouces is well illustrated at Laidhay Croft; where the buildings date from around the time of the captain’s report of 1815. 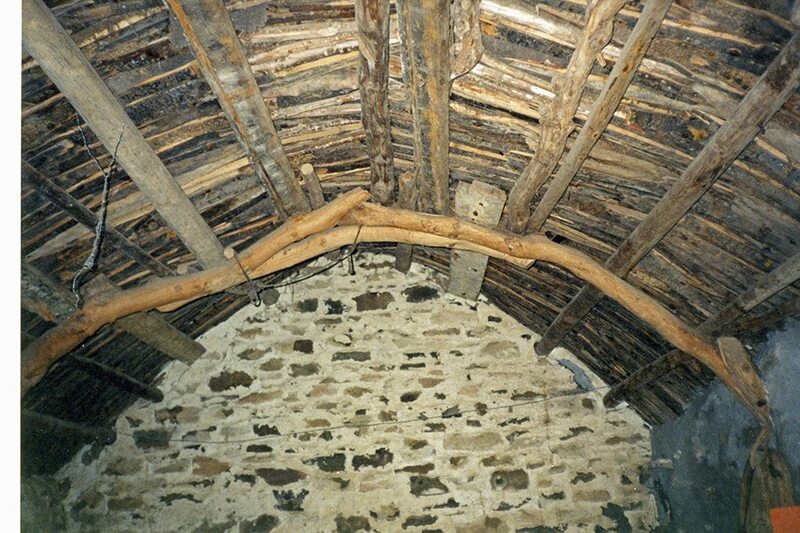 The barn roof, is of interest, being original; constructed from a few branches and small pieces of driftwood; painstakingly gathered from the adjacent North Sea.